The List of Important Expected Computer Questions for Upcoming SBI PO/Clerk and IBPS Exams was given below. Candidates those who are preparing for the examinations can use these questions. 1).Which of the following menu has to be selected to print a document? 2).The user which assigns to a document is called as_________. 3).If you need to send letters to the people regularly, which type of program would you use to create the letters? 4). In a computer mouse and keyboard are used to give ________. 5).Which of the following is used to save the data permanently? 6).Among the following statement which is not true about computer files? 7).Which among the following is optional memory to run the computer system? 8).__________ is a translator program which was used in Assembly Language. 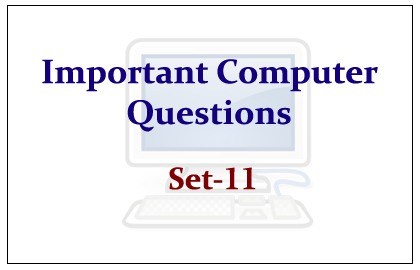 9).Which program is used to controls the various computer parts and allows the user to interact with the computer? 10).In Microsoft office Excel document, each cell is referred to by its cell address, which is called as__________.